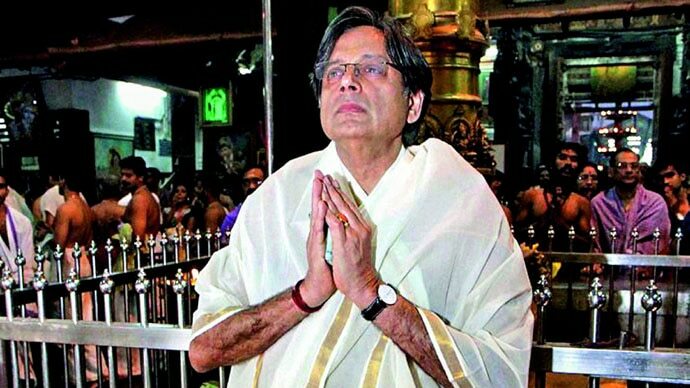 In the Sabarimala case, Tharoor said faith is above SC verdicts. Surely, faith should also be above poor jokes? Shashi Tharoor is a smart man. Rather, he is a perspicacious, sagacious gent. But there is a thin line between smart and smart alecky. Tharoor recently crossed that line, by 280 characters. Trying to take a potshot at the Uttar Pradesh Chief Minister Yogi Adityanath, Tharoor shared a picture of the CM with his cabinet colleagues taking a dip in the Kumbh, with the caption: ‘Want to clean the Ganga, but also want to wash off sins in it. Everyone is naked in this sangam. Jai Mother Ganga’. This is a classic case of throwing the Yogi out with the Ganga water. Tharoor presumably wished to mock only his political opponent, but chose a sensitive subject to make a joke, and obviously ruffled a lot of feathers — not just saffron-coloured. Now, of course, you are free to joke about anything you want. In fact, there is an entire angst-industry that runs on how ‘only Hindu icons are made fun of’. But Tharoor, apart from being a wise man, also calls himself a religious man. He writes long, erudite articles on his ‘Hindu-ness’. He has started talking more on such subjects since his book Why I am a Hindu came out, but that’s probably coincidence. Tharoor was being considerate about the faith of his constituents in Kerala. As these lines admirably demonstrate, the Thiruvananthapuram MP understands that some beliefs are dearer than reason. If Tharoor can risk his ‘liberal’ badge to defend the stand that some feelings are above court verdicts, surely he understands that those feelings are above not-even-witty jokes? Or is it that only his constituents’ faith deserves respect, while others’ beliefs can be mocked? We can understand Tharoor doesn’t like what Yogi Adityanath stands for. But he should learn to shoot at the target, and not make his own self collateral damage. Not only did Rajbhar keep his attack squarely on the politicians, he also managed to remind people of the snark Union minister Nitin Gadkari recently threw at his own party. In nine long years, Tharoor did not learn that wisecracks are not always wise, specially for an elected politician.